WASHINGTON, DC, 24 FEBRUARY 2010 / PRNewswire-USNewswire  National Museum of Women in the Arts (NMWA) presents the New York Avenue Sculpture Project, a dynamic new space that will enhance D.C.’s public art profile by featuring changing installations of contemporary works by women. The project is organized by NMWA in collaboration with the Downtown D.C. Business Improvement District, the D.C. Office of Planning and other agencies. “Bringing NMWA out into the street has been a dream of the museum. We are grateful to our partners who share our excitement. This project will beautify our city and serve as the first and only major sculpture boulevard in the nation’s capital,'” says NMWA Director Susan Fisher Sterling. 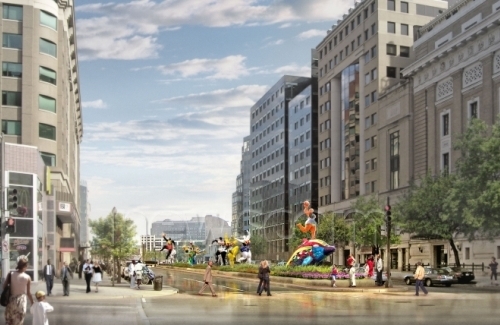 The New York Avenue Sculpture Project will improve the downtown visual environment following a tradition begun by city planner Pierre L’Enfant in 1791. ”The New York Avenue culture gateway supports major local planning and revitalization initiatives and will be a delightful new destination for D.C.’s 25 million annual visitors. “This is an exciting new venture for the District and a wonderful testament to the contribution of women in the arts,” says Mayor Adrian Fenty. Joined by partners, supporters, officials and neighbors, NMWA will dedicate the first phase of the sculpture project — the refurbishment of the 1200 block in front of the museum — on April 28, 2010. The celebration, chaired by Board Members Marcia Carlucci and Marlene Malek, will include community events. The removal of old plant materials, construction of sculpture pads, lighting and landscaping has begun. When all four phases are completed around 2015, four major medians along New York Avenue will be transformed into lively sculpture islands. The inaugural artist for the New York Avenue Sculpture Project is Niki de Saint Phalle (1930–2002), a self-taught French sculptor drawn to public art. Her vibrant works celebrate women, children, heroes, diversity and love. 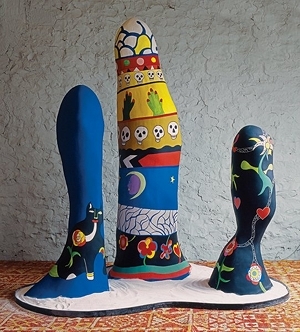 Selected with the Niki Charitable Art Foundation and federal and local agencies, the four whimsical sculptures to be installed are part of Saint Phalle’s series of Nanas, Black Heroes, Animals and Totems. The project is supported by Medda Gudelsky, the Downtown D.C. BID, the Philip L. Graham Fund, the Homer and Martha Gudelsky Family Foundation, NMWA members, the District Department of Transportation and others. NMWA is the only museum dedicated to recognizing the achievements of women artists of all periods and nationalities. Visit www.nmwa.org/sculptureproject for more information. WASHINGTON, DC  In a few weeks, a fanciful and colorful trio of women in bathing suits will rise from a median on New York Avenue NW. They promise to be showstoppers, as contemporary as the last splash of pop art, as exaggerated as Las Vegas showgirls. They will be visible from the Treasury Department all the way down to the jumbled landscape that was once the old convention center. The sculptures are part of a public art project, organized by the National Museum of Women in the Arts, that is scheduled to appear in April, the museum has announced. The work in the first act of what is called the New York Avenue Sculpture Project is by the late French sculptor Niki de Saint Phalle, whose outsize sculptures are both celebratory and bold. Her fiberglass forms are 12 and 15 feet high and will be placed in four groups. One sculpture represents basketball icon Michael Jordan flying through the air, a hapless opponent unable to stop him. The museum, along with its public and private partners, hopes the displays will bring some much-needed zing to its sector of downtown and spark interest in the 23-year-old museum. The first sculptures will be placed on the median of the 1200 block of New York Avenue, outside the museum. By 2015, sculptures will have been installed along New York Avenue from 13th Street to Ninth Street, the heart of the Mount Vernon Square redevelopment efforts. “This part of the city really needed a project like this. There is a lot of good stuff going on, but the street lacks character and it doesn’t pull together,” said Patricia Zingsheim, the associate director of revitalization and design at the city’s planning office. She said the approvals were given because the project benefits residents and visitors. Plus, it was unique. De Saint Phalle, a self-taught artist, used mosaic glass and colored stones to decorate the three women, whose bodies are chalk white, canary yellow and ink black, a 1999 grouping called “The Three Graces.” Also part of the Washington project will be her “Serpent Tree,” created in 1999, and “Nana on a Dolphin,” another outsize woman standing on the back of a dolphin, made in 1998. The sculptor, who died in 2002, is known for creating the much-talked-about Stravinsky Fountain outside the Centre Georges Pompidou in Paris. Formal dedication of the sculptures is scheduled for April 28. The project’s supporters are banking on the appeal of the “Graces” sculpture’s voluptuous hips. “Excitement and fun shouldn’t be out of our vocabulary,” Bradley said. Niki Pieces Will Kick Off NMWA Sculpture Project in D.C.
“Her vibrant works celebrate women, children, heroes, diversity and love,” says the NMWA press release. Four of Niki’s sculptures will be installed on the 1200 block of New York Avenue in front of the museum. NMWA will dedicate this first phase of the sculpture project on 28 April 2010. For more information, visit www.nmwa.org/sculptureproject. Read the Washington Post article about Niki de Saint Phalle and the Sculpture Project. NEW YORK, NEW YORK, 18 FEBRUARY 2010  A one-person exhibition of Niki de Saint Phalle including selected sculptures and works on paper will be on view at the Nohra Haime Gallery booth No. 232 at the Armory Show  Modern. The exhibition will feature two historical works from the 1960s: Old Master, a target picture in plaster, and My Frankenstein, a heart-shaped assemblage of found objects. Dawn, one of her signature Nanas, will be the central focus of the exhibition, along with Double Tête and Trilogie Des Obelisques. Furniture such as the Four Nanas Table, the Owl Chair and Snake Chair will also be on view, along with her multiples California Nana and Couple Vase. The artist’s playful sense of caprice will be further revealed in the remarkable selection of works on paper, depicting almost naïve imaginary landscapes, creatures and symbolisms. Saint Phalle’s work is bold and restless. Its clever combination of fantasy, irony and social commentary is a manifestation of the artist’s exuberant life and uncanny imagination. Given a few moments before this arresting exhibition, the viewer will be instantly drawn into Saint Phalle’s realm, one of whimsy and enchantment. Niki de Saint Phalle, French-born, self-taught sculptor, painter and film maker of international prominence, emerged in the 1960s as a powerful figure in the Parisian art scene. Her work can be seen in major museums and cities around the world. Amidst her large-scale installations are the Stravinsky Fountain near the Centre Pompidou in Paris (1983), the Tarot Garden at Garavicchio in southern Tuscany, and the Grotto in Hannover’s Royal Herrenhausen Garden (2003). In 2002 she was awarded the 12th Praemium Imperial Prize in Japan, considered to be the equivalent of the Nobel Prize in the art world. Born in 1930, Niki de Saint Phalle spent her life between France and the United States, where she later became a resident. She died in 2002 at the age of 71 in La Jolla, California. The Nohra Haime Gallery is pleased to announce that it is now representing the estate of Niki de Saint Phalle in New York. A one-person exhibition of works by Niki de Saint Phalle, including selected sculptures and works on paper, will be on view at the Nohra Haime Gallery booth No. 232 at the Armory Show  Modern. The exhibition will feature two historic works from the 1960s: Old Master, a shooting painting in plaster, and My Frankenstein, a heart-shaped assemblage of found objects. Dawn, one of Saint Phalle’s signature Nanas, will be the central focus of the exhibition, along with Double Tête and Trilogie des Obelisques. Furniture such as the Four Nanas Table, the Owl Chair and the Snake Chair will also be on view, along with her multiples California Nana and Couple Vase. The exhibition will be open to the public on March 4–7, following a VIP preview on March 3. Learn more. CHARLOTTE, NORTH CAROLINA  He made macho sculptures out of wheels, chains and gears. She created plump, brightly patterned earth mothers. Together they were the Bonnie and Clyde of the modern art world. Niki de Saint Phalle and Jean Tinguely, partners in art and a married couple in life, are together again at the new Bechtler Museum of Modern Art, 402 South Tryon Street in uptown Charlotte. Charlotteans have fallen in love with the Saint Phalle “Firebird” in the museum’s outdoor courtyard, but there’s more inside. The museum’s second-floor gallery is dedicated to both artists, who met and started working together in the ’50s and were married in 1971. Visitors can see three of Tinguely’s trademark kinetic sculptures along with several two-dimensional works. De Saint Phalle is represented by “nanas” in two and three dimensions, as well as several reliefs and drawings. Niki de Saint Phalle was born in France in 1930, but after losing their fortune in the stock market crash, her family moved to New York soon after. Niki was interested in art from an early age, although sometimes her enthusiasm got her into trouble. She was expelled from the exclusive Brearley School for painting the fig leaves on the school’s statues red. Niki eloped with a music student at 18, quickly had two children and found herself living the sort of domestic life she always had despised. In her early 20s, she suffered a nervous breakdown and was treated with electroshock therapy and drugs. She turned to painting as part of her recovery. Meanwhile, she’d begun modeling, and became acquainted with some of the artists living in Paris while on a modeling assignment. Her family moved back to Paris in the mid-1950s, where Niki continued to paint. She met artist Jean Tinguely, and Jean and his wife both encouraged her artistic efforts. Niki asked Jean to weld an armature for one of her sculptures, the first of their artistic collaborations. By 1960, both Niki’s and Jean’s first marriages were over. By the end of the year, they were sharing a studio and living together. Jean Tinguely, who was almost a generation older than Niki, had a style that was markedly different from Niki’s. A member of the group of artists known as the “New Realists,” Jean’s works were masculine, often made of iron, steel and wood. Many of his sculptures had working mechanisms. “Homage to New York,” one of his most famous installations in the garden of New York’s Museum of Modern Art, was a mechanical sculpture that self-destructed. In contrast, Niki’s work had a cheerful, lyrical sensibility and a strongly feminist nature. While earlier in her career Niki had experimented with various themes, including a period in which she created paintings by shooting at containers of paint to form designs on the canvas, she ultimately settled into her best-known style with the creation of her voluptuous, brightly painted women, the “nanas.” While not all of Niki’s subsequent work includes a nana, she continued to produce them, in all sizes and many media, for the rest of her life. Niki and Jean eventually got married, and they were each other’s biggest champions and most frequent collaborators. They worked together to create the giant nana sculpture “Hon” at the modern art museum in Stockholm. Visitors to the museum could enter the giant figure of a woman by walking between her legs; inside was one of Tinguely’s mechanical sculptures. But the couple’s best-known joint effort is the 1983 Igor Stravinsky Fountain outside the Pompidou Center in Paris, a group of 13 sculptures that dance, gyrate or stand majestically on the surface of the water. Niki and Jean worked together on many projects for 30 years until Jean’s death in 1991; Niki continued stewardship of his works until she died a decade later. 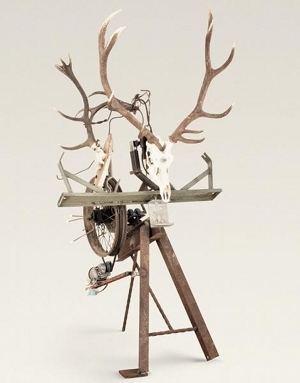 The Bechtler family had a special relationship with Tinguely, according to the museum’s curator, Michael Godfrey. When Andreas Bechtler was looking for more Tinguely pieces for the Queen City museum, to add to those already in the collection, he discovered that a dealer had two sculptures that incorporated some of his father’s hunting trophies. These works, “Water Buffalo” and “L’execution,” are now in the Bechtler Museum’s second-floor gallery. Tinguely’s relationship with the Bechtler family brought him to Charlotte long before the museum was even in the planning stages. The lobby of the Carillon building on Trade Street houses a monumental work of scupture by Tinguely hanging over the fountain. While Tinguely was visiting Charlotte he made a number of other works, some of which now hang in the Bechtler gallery. The Bechtlers also knew Saint Phalle. “When the museum came on track and we decided to look to get monumental pieces by either Tinguely or Niki to go outside, we went to Atlanta, where she was having a major exhibition in the Botanical Garden,” said Godfrey. “We saw the ‘Firebird’ and fell in love with it.” The 12-foot, mirrored sculpture was purchased from the Bonnier Gallery in Geneva, which was reluctant to sell it at first, but then decided it would be better to have it on public display. 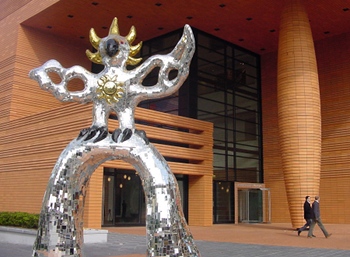 The museum has relationships with both the Niki de Saint Phalle Museum in Japan and the Jean Tinguely Museum in Basel, which was designed by the same architect as the Bechtler, Mario Botta. The Bechtler Museum of Modern Art hopes to mount major shows about both artists in the future. Considering that the Bechtler family owns other works by both artists, chances are Charlotteans will be seeing more of both Niki and Jean. Photo 1: Niki de Saint Phalle’s mirrored “Firebird” greets visitors to the Bechtler Museum of Modern Art on South Tryon Street. “Niki de Saint Phalle and Jean Tinguely, partners in art and a married couple in life, are together again at the new Bechtler Museum of Modern Art in uptown Charlotte, North Carolina. “Charlotteans have fallen in love with the Saint Phalle Firebird in the museum’s outdoor courtyard, but there’s more inside. The museum’s second-floor gallery is dedicated to both artists, who met and started working together in the ’50s and were married in 1971. “Visitors can see three of Tinguely’s trademark kinetic sculptures along with several two-dimensional works. Saint Phalle is represented by ‘nanas’ in two and three dimensions, as well as several reliefs and drawings…” Read the entire article.